I was bored and wandering through my dungeon , read "basement" today and after having a panic attack about how close it is to a two story arc on Hoarders®, I rounded up some really rare and good examples of Canadian modern design. No one really cares except us proud Canadians which is unfortunate as these chairs are all very well designed and stand up quite nicely to any American or European designs of the time. 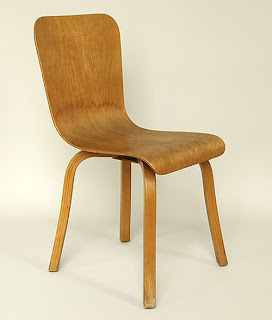 From far left: A side chair designed by Waclaw and Stykolt Czerwinski , and Hilary Stratford in 1946 for the Canadian Wooden Aircraft company in Stratford. 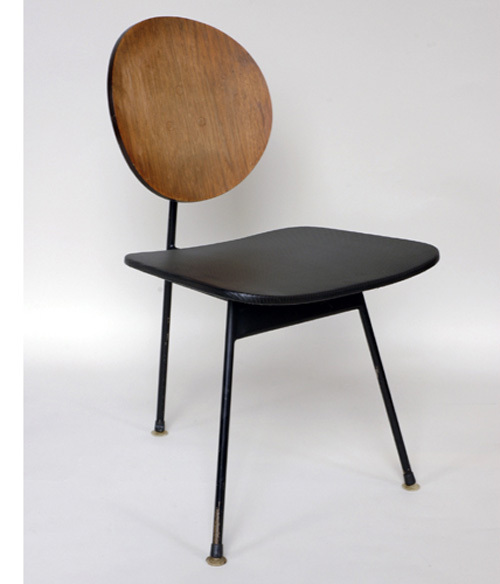 It seems after the War, not only the Americans (see Charles and Ray Eames) were using new techniques and materials utilized and created during Wartime. These sold around the same time as the Eameses moulded plywood designs and are very similar in aesthetics and resemble some early prototypical works by them as well. An incredibly simple and rather lyrical design. A bent wood shell and crossed wooden legs. Really a pared down simplistic approach but very successful and very good looking. Second from left: the holy grail of Canadian Design, the Stephan Siwinski three-legged side chair. Designed in 1958 in Toronto. Another successful and simple design. Lollypop bentwood seat back on a welded steel rod base. The thing that really appeals to me on this chair is the centre support that is widened rather than a simple rod. Such a small thing really makes a big difference in my opinion. Next up: The Russell Spanner side chair. Designed around 1950, this chair is made from simple readily available parts. 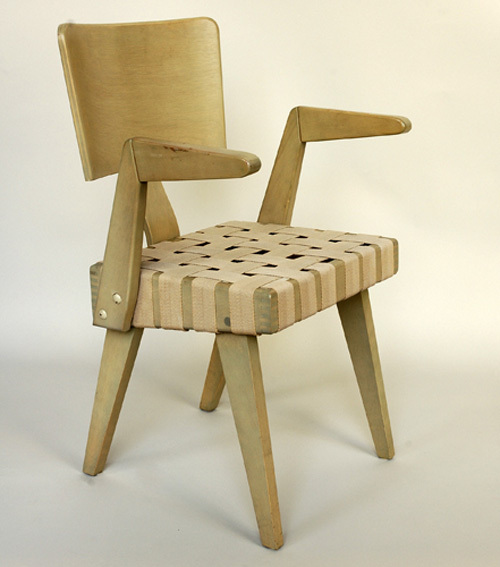 Birch frame , moulded plywood (see a trend here?) and canvas webbing. The example above is the side chair version. I also have a few lounges with arms as pictured below as well. Nice nonetheless and Canadian to the core. 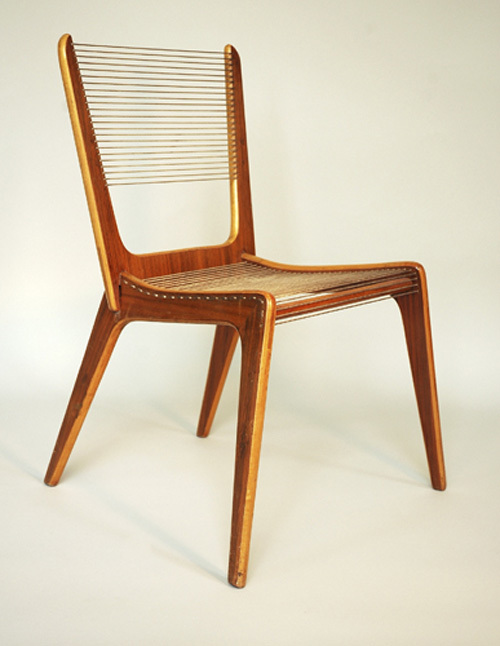 The cord chair designed by Jacques Guillon... Could he have a more French name?, around the mid to late 1950's. These were manufactured in Montreal , go figure..
Made from laminated wood and nylon cording which can supposedly hold up a family of French elephants. So there you have it. A trip to my basement saves you a trip to a museum. That said, these and other pieces of Canadian design can be found at the DX (design exchange) on Bay street in Toronto. The single images were actually pilfered from their site as I am too lazy to shoot mine. They seem to be the only ones other than me that cares about these rare beauties so tell all your friends and get edumacated! you're wrong about no one being interested in these chairs - the book Modern Furniture in Canada 1920 to 1970 is in more than 200 national, university, and museum libraries outside Canada.